Dun & Bradstreet launches cloud based D&B Credit™ to enable financial decision makers to mitigate risks and identify growth opportunities Next generation risk management platform provides intuitive, user-friendly access to world’s largest commercial database. This issue includes Country Risk 2014 Mid-Year Update. Please use this form to get this free edition. get free "D&B’s Global Economic Outlook to 2018"
This issue includes news for the ASEAN region and Country Risk Update. Please use this form to subsribe on new D&B edition and add the text "D&B ASEAN Newsletter" in your request. Please use this form to subsribe on this D&B edition and add the text "D&B Country Insight" in your request. SHORT HILLS, N.J.--(BUSINESS WIRE)-- D&B (NYSE: DNB), the world's leading source of commercial information and insight on businesses, today introduced Hoover's Analytics, a new product to help small businesses segment and evaluate their customers and prospects to identify new growth opportunities. In addition to the D&B predictive analytics solutions launched earlier this week, this new product gives small businesses the edge to anticipate tomorrow's opportunities, today. D&B Country Insight Services upgrades Latvia's country risk rating amid a strong economic performance and high euro introduction probability. »»» D&B Country Risk Indicators for 3 Baltic countries at the December 2012. 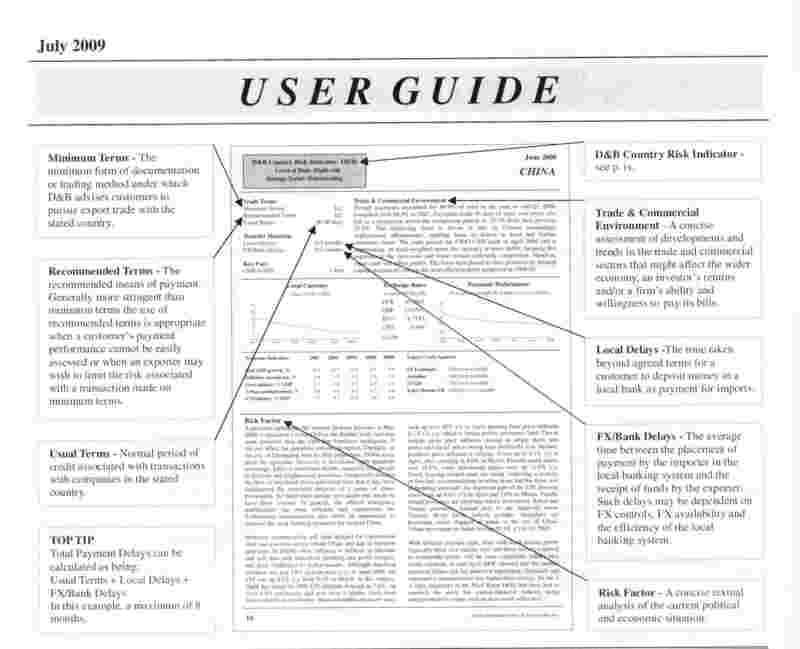 DB2d - This "DB" Rating Indicates: Low risk Low degree of uncertainty associated with expected returns. However, country-wide factors may result in higher volatility of returns at a future date. Trend: Deteriorating The country's overall risk profile is deteriorating owing to adverse political, commercial, economic and/or external developments. DB4a - This "DB" Rating Indicates: Moderate risk Significant uncertainty over expected returns. Risk-averse customers are advised to protect against potential losses. Trend: Stable The country's overall risk profile has not changed appreciably, even though some minor changes to its political, commercial, economic and/or external risk environment may have occurred. DB3c - This "DB" Rating Indicates: Slight risk Enough uncertainty over expected returns to warrant close monitoring of country risk. Customers should actively manage their risk exposures. Trend: Stable The country's overall risk profile has not changed appreciably, even though some minor changes to its political, commercial, economic and/or external risk environment may have occurred. In November 2010, D&B announced the launch of a Trade Exchange Program in Russia, a payment monitoring system that will give companies insight on their commercial credit portfolios. The roll out of the Russian Trade Exchange Program is an extension of the D&B Global Trade Exchange Program, where we collect trade, or accounts receivable data, from our customers. This data is a critical input into our DUNSRight® Quality Process and is a key component of our predictive indicators. Trade in Russia will help drive our ‘Unassailable Data’ strategy – to have 100% complete linked identity coverage of the known global B2B market, each containing 1+ piece of trade. Our 2011 goal is to collect 500K business records with more than 1 unique trade references in Russia. While this goal is ambitious, the team is working vigilantly and we believe it is achievable. 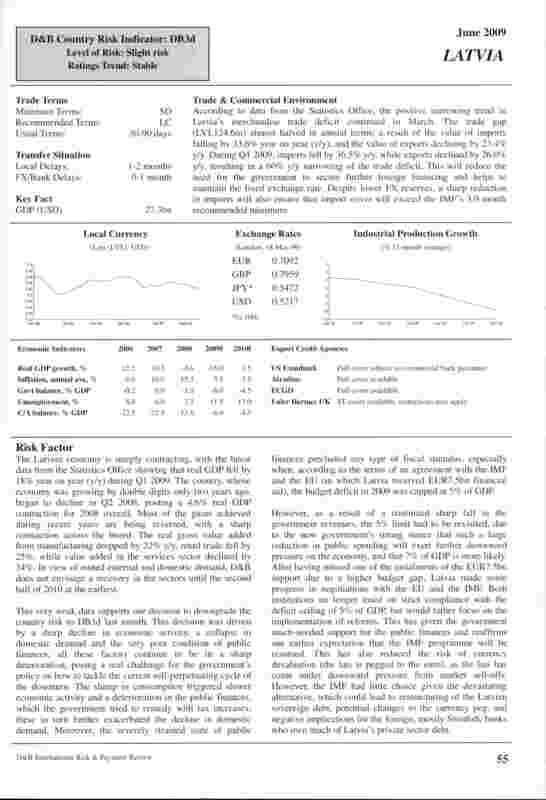 In May 2010 edition of D&B “International Risk & Payment Review” the business environment rating of Latvia was decreased next time in last 9 months from DB4a to DB4b. D&B comments: "D&B downgrades Latvia's country risk rating as political risk increases". Estonia rating is now DB3a and Lithuania – DB3c. We hope that this D&B information could be interesting and useful for you. 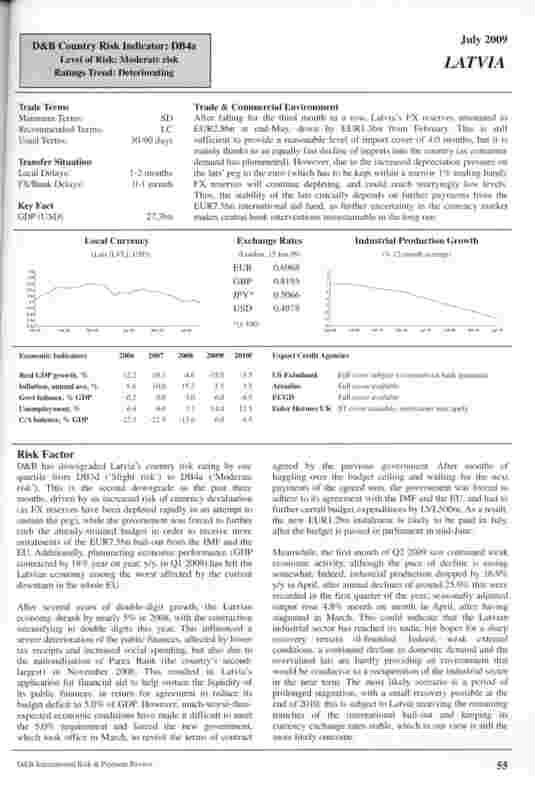 There are 2 pages of country Risk reports about Latvia from June 2009 and July 2009 editions of the D&B "International Risk & Payment Review". In July 2009 D&B rating of Latvia was decreased last time from DB3d to DB4a. Estonia rating is still DB3a and Lithuania - DB3c. Last time the Lithuanian rating has been decreased by 1 step in June 2009. »»» 17.12.2009. D&B database in Romania. 100% coverage of the business company universe in Romania on D&B Database – over 1.8 Million Records! »»» 12.11.2009. D&B FOCUS: New and Improved Paydex. November 2009. Country Risk Services’ (CRS) is pleased to announce a considerable advance in the coverage for the payments performance data we provide.CRS has just completed a re-engineering of the collection of its cross-border transactional experiences which has allowed us to extend our payments performance data to 96% of the countries that we cover. »»» 28.09.2009. D&B FOCUS: Doing Business 2010. October 2009. The World Bank published in September the 2010 Doing Business Report, which highlights an acceleration in the pace of economic reforms in the world after the financial crisis. »»» 03.08.2009. D&B FOCUS: Global Payments Trends. August 2009. Payments performance deteriorated in Q1`09 in most regions covered by D&B.